Shells, nightmarish sea monsters, even trash -- the ocean doesn't skimp on the weird stuff it sends washing ashore. However, it's rare to stumble upon something that turns out to be worthy of a museum showcase. Yet, that's exactly what happened to a family in Australia, who randomly discovered the world's oldest message in a bottle while casually strolling the beach. On January 21, Tonya Illman and her family were walking the beach north of Perth when a little old glass bottle half-buried in the sand caught her eye. She loved it so much she decided to take it home to display on a bookshelf. Little did she know that it contained a note written written 1886. On the car ride home, her son's girlfriend peered inside the bottle and spotted something she at first thought was a cigarette, but later realized was actually a damp note tied with a piece of string. Concerned it was too wet to be removed without causing damage, they tossed it in a warm oven for a few minutes so it could dry out. When they were eventually able to safely extract it, it was obvious that it was very, very old and a bit tough to decipher. Also, it was in German. “You could clearly see where the twine had made indents into the paper.” Tonya said in a statement. “This suggested to us that it had been in this state for a very long time." Fortunately, Tonya's husband Kym's German skills allowed him to understand at least vaguely what the note was all about. It was a form of sorts that revealed how the bottle had been thrown overboard on June 12, 1886 and requested the finder to provide details about where it was found. The family contacted the Western Australia Maritime Museum, which was able to get in touch with counterparts in Germany, and incredibly, were able to match the note to historical logs that showed it was thrown from a German vessel heading from Cardiff, Wales to Indonesia. Hundreds of other bottles were tossed overboard from the same ship as part of an experiment to track ocean currents. According to the coordinates scribbled on the note, this one in particular was tossed into the water roughly 600 miles off the coast of Mandurah, Australia. Having gone undiscovered for 131 years and 223 days, it bests the oldest known message in a bottle to date by some 24 years. 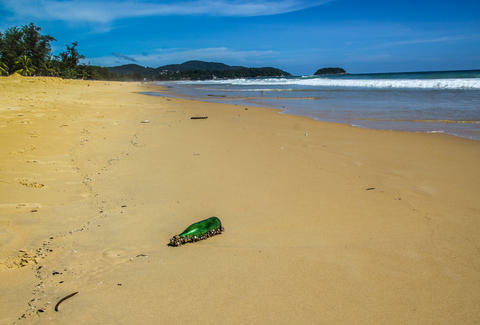 Incredibly, the bottle was also found without a cap though some speculate that a recent cyclone in the area unearthed it, and that it may have been protected by the elements while buried deep in the sand for many, many years. In any case, the Illmans are still kind of shocked by their find, and have loaned it to the Western Australian Museum. Something tells us she'll be find it a more prominent resting place than that bookshelf.